This picture shows the Richelieu River, near Beloeil, east of Montreal, in Quebec. Mont Saint-Hilaire can be seen in the background. Near Beloeil, a bridge crossed the Richelieu River. On June 28, 1864, there was a terrible railway accident on this bridge; it would be the worst catastrophe of its kind in the history of Canada. Around 1:30 in the morning, a train made up of a locomotive, a tender, two baggage cars and 11 wagons filled with passengers, cruised speedily ahead. Just as the train was about to cross the bridge, the locomotive engineer noticed that it had been raised to let boats on the river pass through. Too late! The train fell into the Richelieu River. At least 99 people lost their lives. The Richelieu River was one of the major shipping routes in the 19th century; it was an important trade link between Montreal and New York ,and the steamboats that travelled to and fro ensured the development of the tourism industry. In the 19th century, a pivot railway bridge was erected on the Richelieu River near Beloeil; it swung open to make way for the many boats that travelled on this important shipping route. Originally named Rouville or Mount Beloeil on the map drawn by Joseph Bouchette in 1815, the monteregian hill located 2 kilometres east of the Richelieu only officially bore its current name of Saint-Hilaire in 1916. 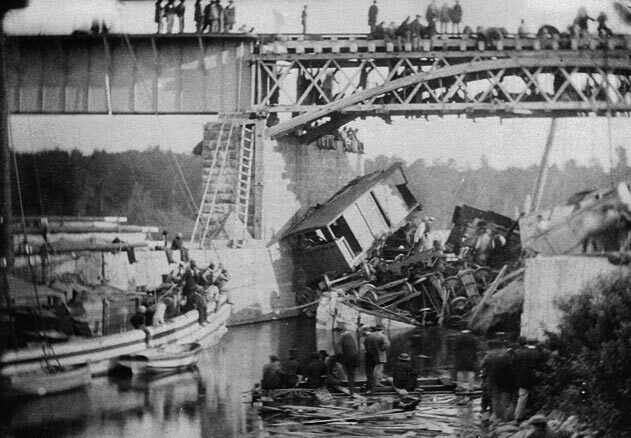 During the accident at Beloeil in 1864, the train was transporting more than 450 German, Polish and Czech immigrants. The mechanic who was driving the locomotive, William Burnie, had only recently been hired.